After someone posted this video on Facebook I took a look at this ‘product’ to see what it is all about. This company are after $500,000 to fund the development of this bracelet during 2016 —and they have nearly achieved it! I can’t believe they are even advertised on Amazon who generally sell things that really exist. I’m calling ‘snake oil’ on this for a number of reasons. If anyone ever receives a product that looks like this and works as shown I will eat my hat. Why? The product doesn’t exist, even as a prototype —it’s only a concept. They haven’t the confidence to crowd fund through a site such as Kickstarter that expects certain minimum standards to be met. SUCH AS A WORKING PROTOTYPE. The Bluetooth interface they say they will use doesn’t have the bandwidth to mirror a smartphone display as shown in the video. The display would be very jerky. I can also guarantee that Android and Apple aren’t going to let you unlock their phones by shaking a Bluetooth device nearby. 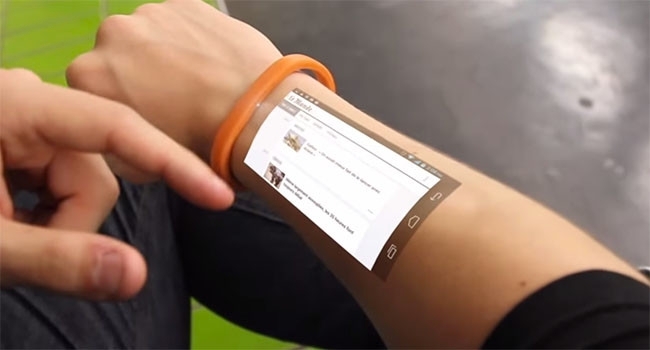 The Cicret bracelet will use a pico projector to project an image onto your skin. So when you touch your arm you are planting your finger into a beam of light. That finger will cast a shadow that’s mysteriously not shown in the video. In the real world that shadow would prevent you seeing some of the scree that’s projected on your skin. At the moment a small pico projector is about 100mm × 85mm and way too big to fit into a bracelet in 2016. A projector will throw light across an angle of about 30° to 50°. To create the image shown in this video requires a projection angle for which there’s technology currently available. So even if this ‘future-tech’ exists, an image projected from a source like this at an angle to the arm won’t project a rectangle —it’s called ‘keystoning’. A good projector will correct up to an angle of about 40° but what’s shown here is a nearly perfect rectangle with the projector at nearly 90° to the skin! And it’s producing that perfect image using a loose bracelet that can move! Let’s talk about how light reflects off surfaces. When you project an image at a screen the projector normally points directly at the screen. That’s so the light bounces back into the room and you don’t have too much of a problem with keystoning. There’s a reason cinemas still do it this way —it works well. In this video the projected image should actually bounce off at a very shallow angle with only a faint image visible at other angles. It’s not going to MAGICALLY reflect up from your skin and into your eyeball. Oh, by the way, you’re going to have an even harder time reading the display if you happen to have black or brown skin. And you hairy guys? Sorry you’re screwed too. Finally there’s the Inverse Square Law that has been known since the 15th century. This is what allows you to stand surprisingly close to a powerful radio transmitter without frying. It says that he intensity of light (or radio waves) is inversely proportional to the square of the distance. This end result is that light hitting the user’s arm furthest from the bracelet must be at least 50 times duller than just beside the bracelet. This is another good reason why cinemas and meeting rooms don’t project stuff down the screen. Keeping the projector at right angles to the screen means the light at the centre and the edges has to travel about the same distance so it’s uniformly bright. So there are 10 reasons I am confident I won’t have to digest my headwear and Cicret’s backers will never get anything back from their so-called‘investment’.